I guess doing this page means I have forgiven him. It was hard, at the age of 14, having a man in the family when I had been allowed to run free up until then. All of a sudden I was having to hold my knife and fork properly, clean my bedroom (and if there was any dust I would have to do it again), eat everything on my plate, always eat a slice of bread with my meal no matter what. 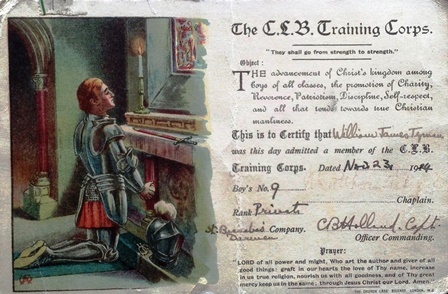 But I also remember wanting to make sure I stayed in the WRAF (and not get kicked out for being lesbian) because I wanted to 'show him' I was as good as he was and was dead chuffed when I got my corporal stripes as I knew my step-father had been a corporal in the army. I recall being miffed that he died before I gained my degree in Classical Studies from London University because I wanted him to be there when I received my degree from the Queen Mother at the Royal Albert Hall. He was part of my motivation (even though, again, it was to 'show him') to get a good degree and I remember him asking me why I hadn't worked harder when I was at school. I also remember that when I took home a plastic guitar with a photograph of Elvis Presley on it (when I was about 14), Jim Tyman went out and bought me a proper guitar and paid for lessons (although I only went three times which disappointed him). However, I did go on to teach myself the guitar. 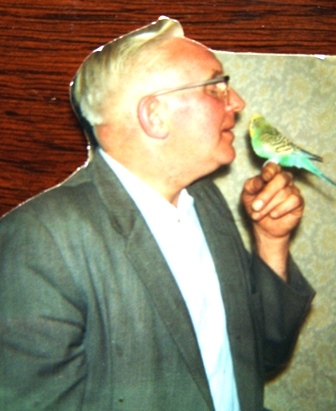 I recall an evening in the Cemetery public house in Darwen, I had gone with my step-father to listen to his friend, Jim, who was playing the banjo and guitar (he was teaching my step-father to play banjo and gave me three guitar lessons). His friend suggested I played the guitar after which he complimented me on my playing. My guitar (and singing) have been a very important part of my life, so I thank Jim Tyman, very much, for that. I guess I also thank him, begrudgingly, for teaching me to hold my knife and fork properly. And if he hadn't married my mum when I was 14, I would not have been able to go to Switzerland with the school. Nor would I have had a push bike and been able to strip it down and put it back together again. 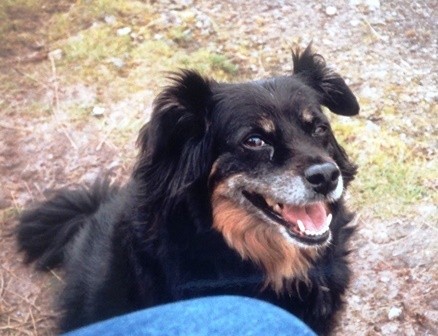 Once I left home (when I joined the WRAF at 17) we started to get on. We had many a session getting drunk on his home-made wine and beer and arguing for hours (which upset my mum, as she didn't like us arguing but we were having fun having debates about religion and various other things). And I'm guessing my step-father supported me joining the WRAF, probably saying the army didn't do him any harm or something similar. I honestly do not know what I would have done had I not joined the WRAF as I was bored to tears working in the factory and knowing I fancied other girls but not knowing any. Anyway, thanks, Jim. This is for you. 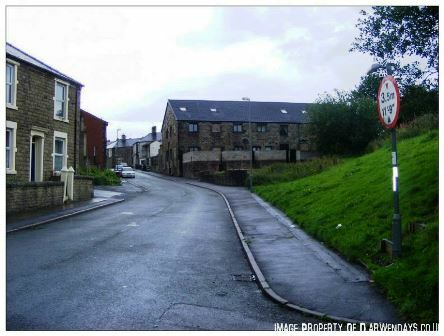 William James Tyman was born on 8th December 1913, I'm guessing he was born at 16 Duxbury Street,Darwen. His mother was Martha Crook (1877-1935) and his dad, John Tom Tyman (1867-1921). I don't know much about his childhood except that he was only eight years old when his father died. He probably went to St Barnabas' Junior School, I'm not sure which secondary school he went to. I am almost certain he would have lived most of his life at 16 Duxbury Street. He no doubt went to the fish and chip shop his father worked in before he died in 1921, at 522 Bolton Road, not far from Duxbury Street. According to another family tree (I need to confirm this with a certificate) Jim's mother, Martha, died on 9th September 1935 at 16 Duxbury Street. Jim probably looked after her. He was 22, then, when his mother died; so both of his parents died in their 50's, his mum when she was 59 and his dad when he was 55. I know he worked at Belgrave Mill at some point. 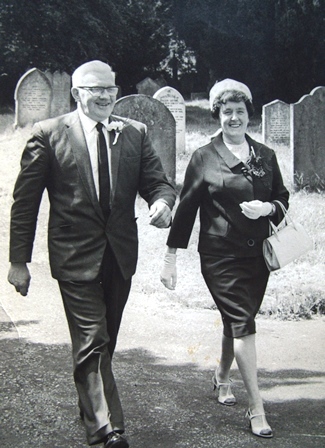 Jim and Vera had one son, Ronald, who was born on 14th February 1938. (Ron, married a Yorkshire girl called Ruby. I was one of the bridesmaids. Ron and Ruby had two children, a girl and a boy. Ron died in 1990). He was probably about 26 years old. I don't know the names of his mates but it is clear they were all in the same unit. 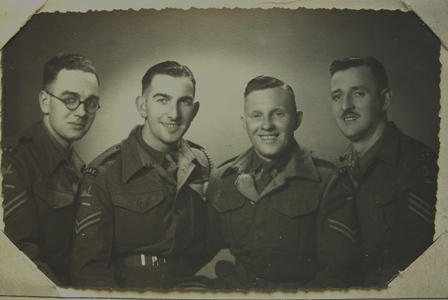 Jim was in the Royal Army Service Corp; he was a messenger and rode a motor bike and served in North Africa. 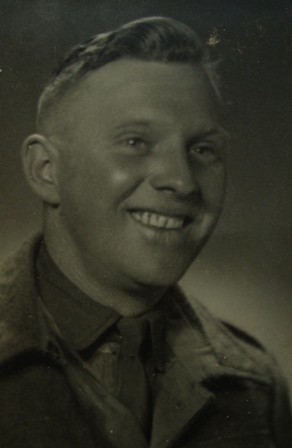 This is clearly some years after the first photo and he as now a corporal so I am guessing that this might have been round about the time of the Dunkirk invasion or perhaps at the end of the war when they were on their way home? 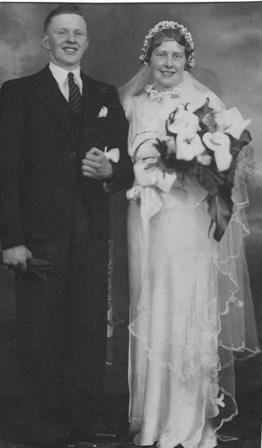 Jim's first wife, Vera, died in 1954. 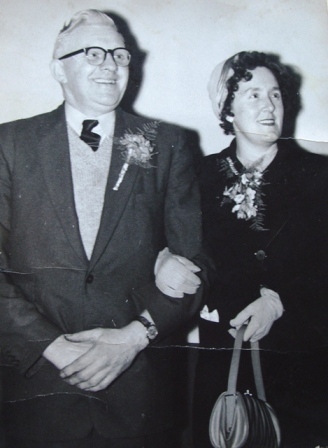 He knew my mum by now because when I went into hospital to have my tonsils out in 1952/3 I was loaned Vera's washing bag and when I came out I was given some purple crocuses and a box of Meltis Newberry Fruits; I think these came from Vera. Ironically, she had a mis-functioning mitral valve, exactly the same as my mum died of some thirty years later. Jim worked at Paragon for many years, first at Starkie Street, where I used to take him his lunch and then at their base at South End. 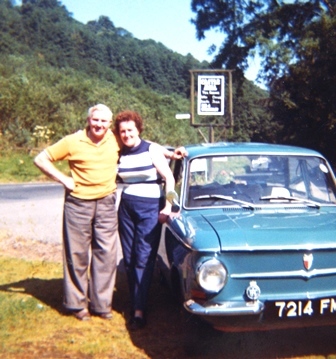 Jim owned several cars, I recall a green van; I think for a while he had a robin reliant, and then an NSU Prinz, his last one was a mini, which he left to his son, Ron. I remember him learning to play the banjo, I am almost sure it would have been a tenor banjo as I recall him learning to play Santa Lucia. My step-father died on 29th July 1978 on Darwen Moors up Whitehall (where he used to go as a lad), he had been picking whimberries. Lassie was with him. I lived in London at the time and had been home for a weekend only a few weeks before; I remember being glad that I had fond memories of that weekend. I'm glad I have done this page, it has helped me realise that I was quite fond of Jim Tyman.